Triangular bowl with rounded corners, tapering towards base. Short square handle. 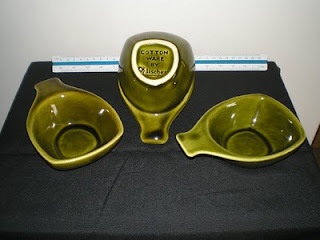 Olive green light gloss overglaze with original white slipware showing through on the edges. Elischer Pottery was started in Sandringham in 1947 by well known sculptor John (Johann Wolfgang) Elischer (1891-1966) and his son, also named John. John (Snr) was born in Vienna and studied in Paris (1910-1911) under the even more famous August Rodin. After serving with the Austro-Hungarian forces in World War 1, he practiced as a sculptor in Vienna. He was also an associate of the Royal Academy. In 1946 Huntley Pottery in Glenhuntly began making slip cast items designed by John Elischer. The business continues today as “Unique Ceramics” at 280- 282 Bay Rd, Cheltenham, Victoria. You probably have some of their stuff without knowing it. Have a look at the bottom of that ceramic port bottle of beer stein from the Dandenong Octoberfest. In 2002, Elischer Street in Canberra was named in his honour. Some Cottonware may have been made for the export market because it was incised “Elischer Australia”. Previously, such as these were simply incised “Elischer”.